I'm not finding that here. Interesting. I went back to the document I was trying this. Here it seems to work for some objects (e.g. picture frame, table outline, freeform drawn object) but not with custom shapes (e.g. trapezoid, segment). Can you by any chance try with one of the custom shapes, please? I've just tried adding a few custom shapes - Trapezoid, Square Star, Donut - to a new document and the "Align Stroke To..." buttons in the Stroke panel work as expected. The same goes for Rectangles, Rounded Rectangles and Ellipses, they all seem to be working fine for me. However, I have experienced some rare occasions where the Stroke, Swatches and Colour panels have had no effect on Text Frame contents. When you convert a shape to a text frame, the Stroke, Swatches and Colour panels move their focus to the text rather than the frame - with those functions instead being taken up by the relevant controls in the Text Frame panel - but every now and again they stop having any effect at all. Could this be a related symptom? In the original post, maxen didn't say what kind of object they were having problems with. Note: Another way of looking at this is that if maxen was working on a text frame with no text in it then it would look like the Stroke panel had no effect on the frame stroke because the Stroke panel for a text frame relates to the text in the frame and not the frame itself. No text so no visible effect. 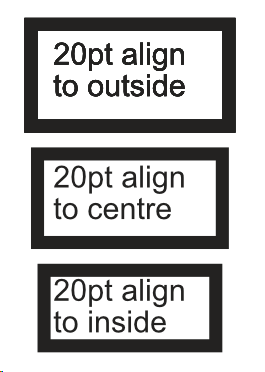 I enclose a stripped down sample document with some objects where stroke align works and some object which refuse to align the stroke to anything other than 'Centre'. My tests on your document show the same issues that you get. I can't see any problems with the shapes other than changing the alignment doesn't do anything on the ones you specified. I drew another trapezoid in the same document and the issue persists there too. I drew a trapezoid in a new document - with the original document open - but that one worked as normal. I went back to the original document and the issue still persists in your shapes. I selected my trapezoid, reverted it to default, and the stroke now works as would be expected on that particular shape but still doesn't on any of the others that had the issue. A copy of one of your problem shapes also has the same issue. Changing the stroke to "No Line Style" and then back to "Solid Line Style" doesn't make any difference to the fact that the alignment still doesn't work. So, after all that, I now have multiple shapes of the same type in the same document which work differently. I think that's one for the big brains at Affinity Towers to work out. Something to do with Arrowheads, maybe? good call. I remember when I created the first object it hat accidentially an arrowhead (even it was a closed object). Revert to default (icon on the toolbar) and assign a new line width > align inside/outside works as expected. Deselect everything and switch in the stroke panel to some arrowhead > create an object > remove the arrowhead. I guess this is a bug. Maybe it is OK that lines with arrowheads are not supposed to align. But it should work again once the arrowhead was removed. I hope the moderators see this on monday an double check. Thanks. Alignment should be disabled if a stroke has Arrowheads, but also should be re-enabled if they are removed. I’ve brought this to he attention of the ‘Arrowheads Department’. On a related note, should the "Align Stroke to..." buttons also be disabled for non-closed curves? At the moment they don't change anything visible - and that's what I would expect - but they can still be pressed. The visible alignment goes back to Centre, as I would expect, but the "...Outside" button is still pressed and I can set different alignments that have no meaning for a non-closed curve. Re-closing the curve re-asserts the selected alignment, which is nice, but should I be able to set an alignment without it making a visible difference? Maybe, instead of disabling the buttons, a little 'info tool-tip icon' could be shown next to the alignment buttons - only when a non-closed curve or a curve with arrowheads is selected - to tell the user that those effects are not visible on non-closed curves (or curves that have arrowheads).